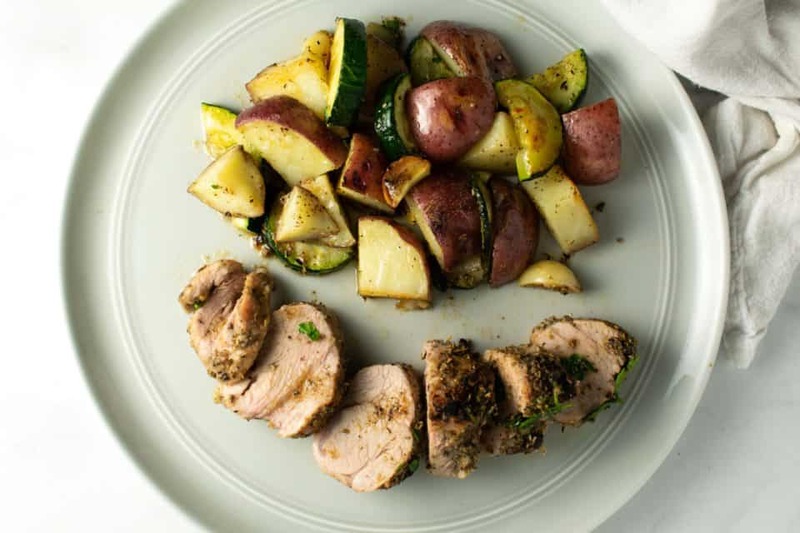 Italian Herb Crusted Pork Tenderloin is a simple dish elevated by deliciously intense flavors like roasted garlic, sea salt, and rosemary. It’s a sheet pan dinner that makes cooking and clean up a weeknight saver. ­­­­­Sometimes after a long day the last thing I want to do is cook. And this is coming from someone who cooks for fun. I understand that coming home to a (not so clean) kitchen, after a trying day, with an even busier night ahead, hungry, can be testing to say the least. I always say that this is when well-intended dinner plans go south and end up with take-out. Maybe you were planning to try a new recipe tonight, but just don’t have the energy now or what you were planning takes too long or too many pots and pans…which are dirty anyway. I know we can’t be the only household that struggles with this! I’ve said it before: fall back recipes. Things you have on hand in case of a dinner emergency. Things I like to have at all times for these nights: jarred pasta sauce (I KNOW, but there are actually decent brands out there now, like Rao’s Tomato Sauce), frozen marinated vegetables, eggs, pasta, pre-minced garlic, and chicken broth. From these ingredients and other pantry items you usually always have on hand, you could easily make a pan sauce to go with many things. 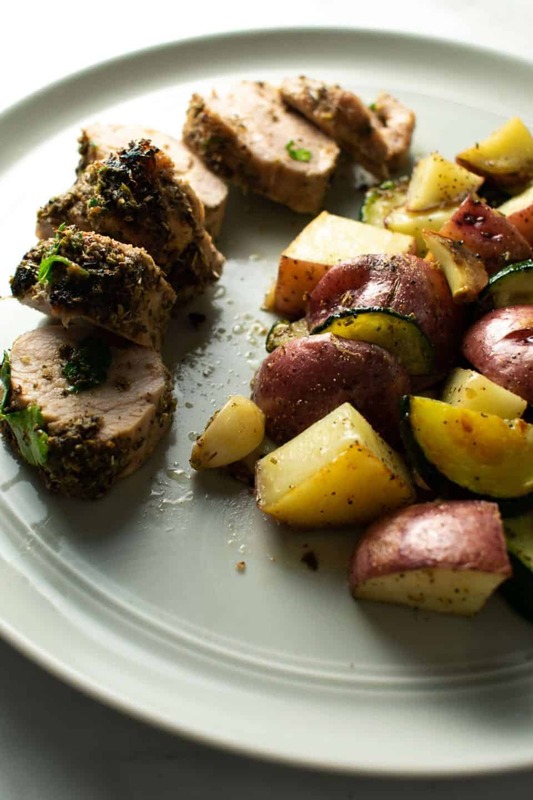 Now…onto the recipe at hand which is Italian Herb Crusted Pork Tenderloin. The flavors are bold Italian seasoning like rosemary and roasted fresh garlic, with sea salt & cracked black pepper, that gets juicy when baked with melted butter and then topped with fresh parsley. 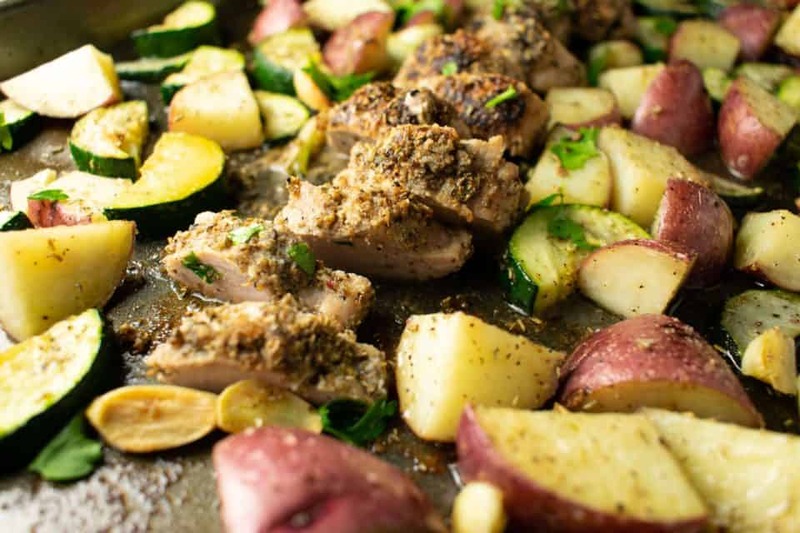 This dinner is an oven roasted sheet pan which means: 1 pan to make dirty, not 2 or 3, and 15-20 minutes in the oven means you can do two things at once. 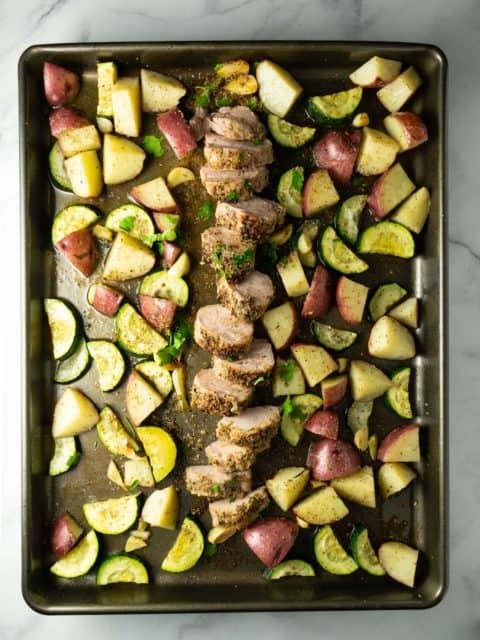 On the same baking sheet, I roasted red potatoes and zucchini…but you can substitute whatever you want. This is one of those dinners to have in your back pocket because it’s made with mostly all pantry ingredients. I recommend brining the pork tenderloin before you cook it because it really makes sure that it doesn’t dry out and leaves you with a moist cut of meat every time. Brining is a way to tenderize meat before you start cooking it. This can be done for up to 12 hours, (like before work), but I usually just do it for an hour or two before I’m ready to start cooking dinner and it works out great. A brine sounds intimidating, but its actually very simple. You can add whatever spices you want, but the 2 ingredients you absolutely need are water and salt. Brine adds a significant amount of water to your meat which therefore adds moisture. The basic formula is 1 cup of salt to a gallon of water, which breaks down to about 1 tbsp of salt to a cup of water. When you brine meat, it should be entirely covered in water. My pork tenderloin took 3 cups of water to cover, so 3 tbsp of salt. After brining, pat the meat dry entirely with a paper towel. Rub the pork tenderloin with the spice rub (salt, pepper, rosemary, oregano, and garlic powder). Its going to seem like a lot of seasoning, but we really want it to have that thoroughly seasoned crust-like taste. Place it on the sheet pan, surround with chopped vegetables that were seasoned with some leftover spice rub and tossed in olive oil. Now, my favorite part that really amps up this whole dish is the fresh garlic. Since they are only chopped in half and not minced, they’re potency remains intact and imparts the flavor…everywhere. Toss them throughout the vegetables and on top of the pork. Then, the pork not only gets moisture from the brine, but fat added from pats of butter lying on top. Yep, its worth it (and WAY lower in calories than oil). 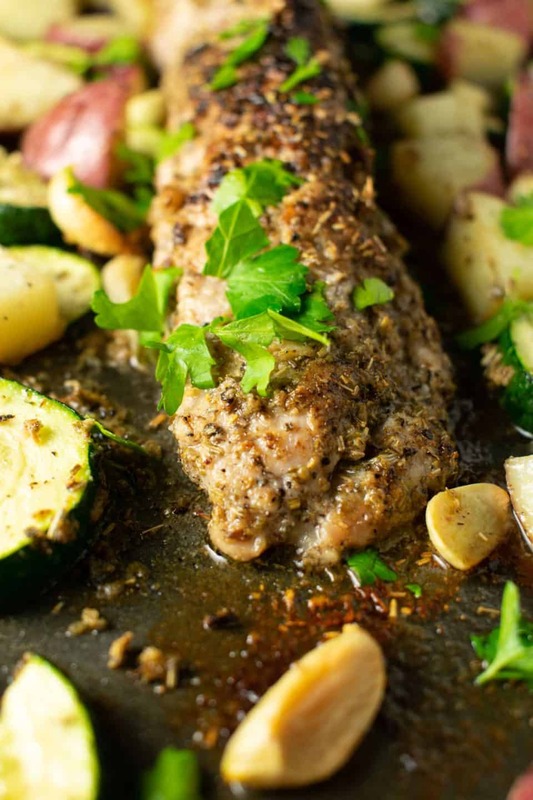 Pork tenderloin is a lean meat that has very little fat, so adding some fat back to the dish can not only give it some moisture, but also flavor. This is true for other lean meats as well, like chicken breast and lean ground beef. The baking sheet broils at 425 for 15-20 minutes and dinner is done. Brine the pork by placing in a bowl with about 3-5 cups of cold water, just until covered. In the bowl, add 3-5 tbsp salt, you should use 1 tbsp per cup of water you needed. Leave to brine for at least one hour. After brining, pat the meat dry entirely with a paper towel. Preheat oven to 425 degrees. Drizzle the olive oil over the pork and rub with the spice rub thoroughly. Place it on the sheet pan, surround with chopped vegetables that were seasoned with some leftover spice rub and tossed in olive oil. Lay the garlic cloves on top and around the pork, toss any extra throughout vegetables on sheet pan. Cut the butter into small slices and lay on top of the pork (so that it melts into the pork and adds in moisture and flavor). Bake for 15-20 minutes or until internal temperature reaches 160 degrees. Take off the baking sheet and place on a cutting board to rest for 10 minutes. Slice the pork and spoon the juices over top on your plate. Top with fresh parsley.